Sharps Compliance offers liability protection solutions for commercial business. 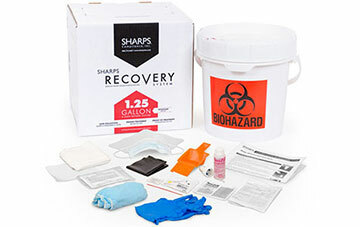 We provide sharps collection and biohazardous spill kits for facilities to protect customers and employees from potentially infectious waste. Additionally, we offer hazardous waste and universal waste services to dispose of items, such as commercial cleaning fluids, batteries, light bulbs and other devices that contain mercury. With a comprehensive management strategy, businesses can safely collect and properly dispose of these wastes, thereby keeping customers, employees and their brand names safe. Our Needle Collection and Disposal System is ideal for restrooms where self-injectors can properly dispose of their syringes and lancets. 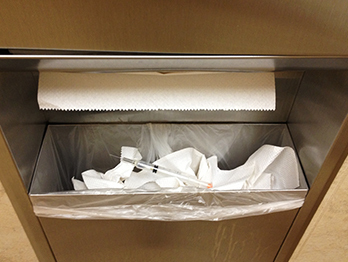 Businesses without proper collection may find sharps in restroom trash cans or toilets. Improper sharps disposal can lead to accidental needle sticks or damage to plumbing if flushed. Accidents happen. 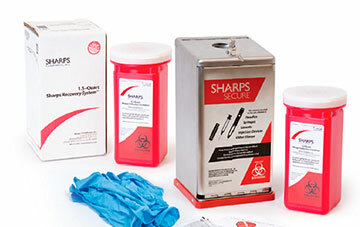 Be prepared with Sharps' unique biohazardous spill kit. This kit contains everything to safely and properly contain the spill material and clean/disinfect surfaces. 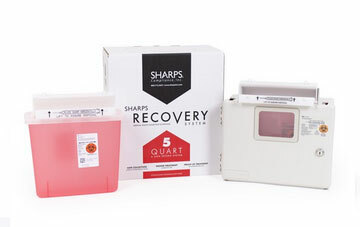 But unlike other spill kits, the Sharps kit also includes proper disposal of the spill waste. Our mailback biohazardous spill kit provides proper spill management at a fraction of the cost of a pickup service. Businesses generate hazardous and universal wastes once products are no longer usable or needed. Such products include hazardous chemicals, batteries, fluorescent light bulbs and other devices that contain mercury. Fines for improper management of these wastes can run in the thousands of dollars per day, per incident. A comprehensive management program from Sharps Compliance can protect your employees and customers from hazards while ensuring compliance with applicable regulations.